Find the best conversation exchange partner so you can practice smart. Bilingua is the newest app of a series of innovative EdTech startups focused on language learning. The breakthrough language app provides guidance throughout the learning process and provides needed motivation with advanced gamification to help users along their language learning journey. 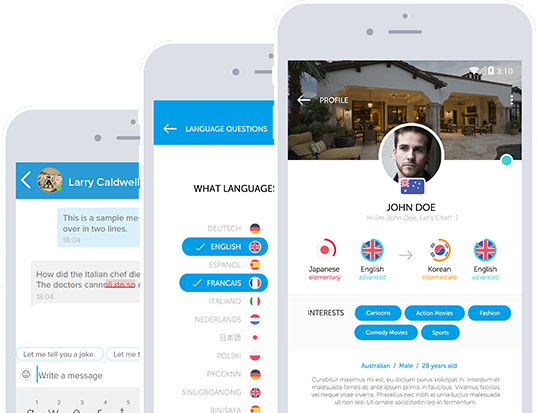 Users are able to find the best language partner for them with the algorithm Creatella developed which matches users by their languages, interests, and personality. A language exchange is when two or more people who speak different languages speak to each other in order to practise and teach a foreign language through conversation. Also known as conversation exchange, this is usually achieved by two native speakers teaching one-another their native language. Bilingua is the gateway to this social and engaging method of language practice. Designed to be your companion as you enhance and enrich your language skills, Bilingua first connects you with native speakers who share similar interests to you and are learning your native language. Once connected, Shiro the bot will help guide the conversation by sharing interesting news articles, conversation topics and questions based around your interests and suggesting translations and corrections. You also have the opportunity to play games with your partners and even with Shiro the bot to improve your language skills! To become fluent in a foreign language you need lots of high quality practice. Compared to the usual ways of practising a language – languages classes and tuition – conversation exchange with native speakers can be more effective in facilitating language and cultural immersion. Bilingua offers you a simulated immersion environment by connecting you with native speakers who can expose you to your target language in its perfect form. Beyond this, you’ll also pick up informal expressions, slang, idioms and many other language features that are in use today, around the world. A language exchange is also a wonderful way to extend your existing language skills and push yourself closer to the fluency and skills you need to communicate with confidence in the real world. Bilingua is the flagship product of Createl.la, a global community of 18 talented individuals from 15 different countries driven by passion and the fulfilment of impacting their local community. Our teams are working to create opportunities for people and improve their way of life through our products. It’s no small feat, but we wouldn’t want it any other way. Creatella was founded by Guillaume Catella with the vision of creating an entrepreneurial company that produces amazing products to improve the lives of many. He saw opportunities in fast-growing South East Asia and launched Creatella in Singapore in July 2015. Prior to completing his MBA, Guillaume was project manager for a Japanese gaming company and founder of a music web magazine.